Looking for a delicate, buttery, crispy cookie chock-full of pecans and chocolate chips? Looking for a cookie that bakes so long that you have time to catch up on the Young and the Restless (can you believe Patti is back in Genoa City to seek vengeance on Jack?!) while you wait? Well then the Noah Bedoah is the cookie for you! I have my mother and the lack of eggs on hand to thank for the discovery of this cookie. The recipe is from the Wilton Cookie Exchange cookbook that I received from my mother for Christmas a few years ago (along with lots, and lots, and LOTS of other wonderful baking supplies). I’d made quite a few recipes from the book but always seemed to overlook the Noah Bedoahs because they looked like a crisp cookie. I’m a soft cookie kinda gal — always have been — until one fateful night when I had a hankering to bake some cookies. 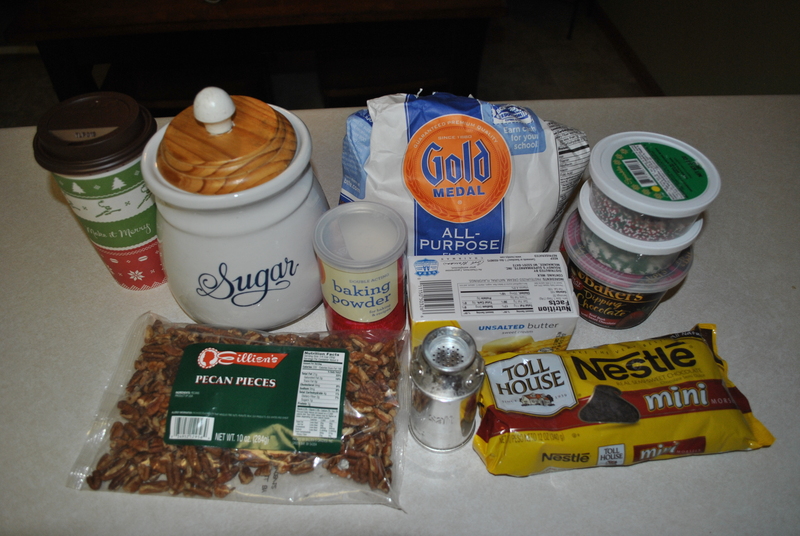 I went into the kitchen and began assembling the necessary ingredients to make chocolate chip cookies. I opened the fridge and found that the eggs were gone. My husband had used the last of them to make me breakfast in bed that morning. DAMN HIM! So what’s a girl to do? I paged through my Wilton cookbook and found that the Noah Bedoah recipe was the only one that didn’t require eggs. Hmm…well I suppose I could try it. After I finished mixing the dough I took a little sample from one of the beaters and wasn’t impressed. I had low expectations for this one…low indeed. I baked the cookies, let them cool, and then tried one. SWEET FANCY MOSES, THEY WERE DELICIOUS! I shared them with my friends and family and was met with the same reaction. So now this crisp, delicate cookie has been added as a ‘go-to’ recipe when I need to impress. Enjoy! Your ingredients. The large “Ho Ho Mint Mocha” from Caribou Coffee to the far left isn’t part of the recipe. It’s just delicious — thanks for the tip Angie! Combine flour, baking powder and salt. 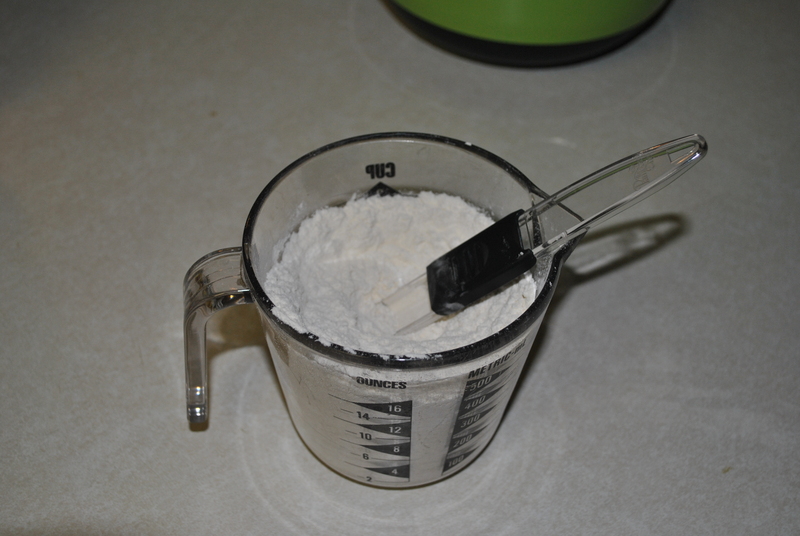 I mix everything together in a measuring cup and stir to combine using the same teaspoon. I’m all about efficiency (read: Lazy) in my kitchen. Cream together butter and sugar with an electric hand mixer until fluffy. Beating the mixture until it’s fluffy is important. Some folks will just mix until everything is combined, but there is this magical moment after 2 or 3 minutes of mixing when the butter changes to a fluffier consistency…that’s where you need to be. 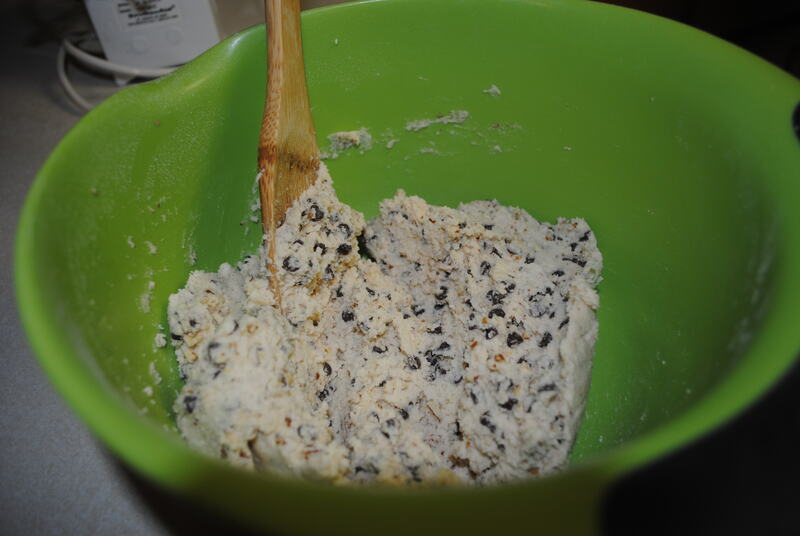 Add flour mixture to the butter mixture and then stir in the chocolate chips and the finely chopped nuts. You can buy finely chopped pecans in the store but I buy them whole and then use a hand chopper because that’s how I roll (chop, actually). Plus it’s a nice upper arm workout that makes me feel better about being surrounded by so much butter. 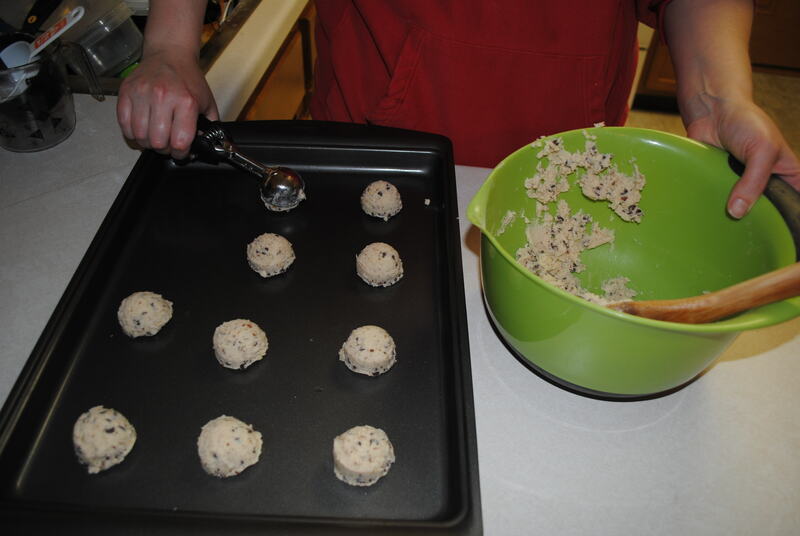 Using a medium sized cookie scoop place dough on the cookie sheets. 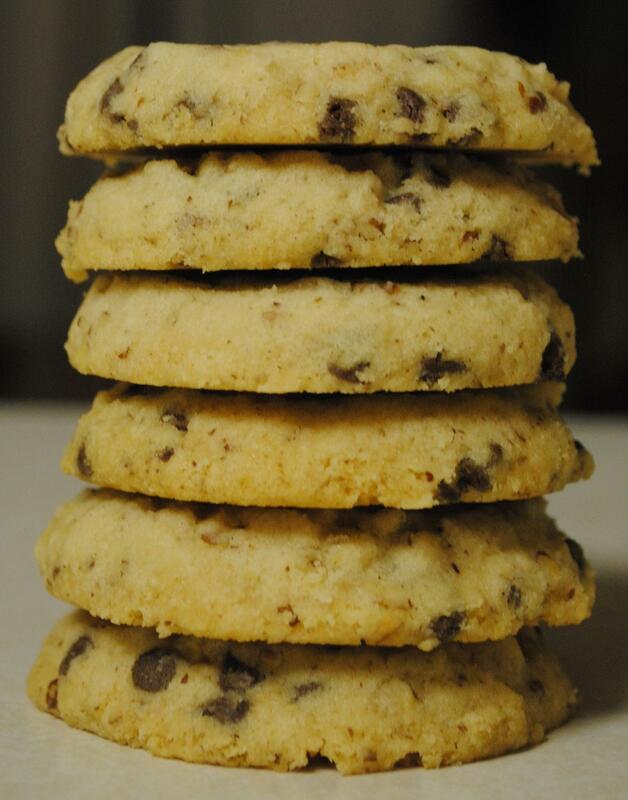 Use the bottom of a glass to flatten each cookie. 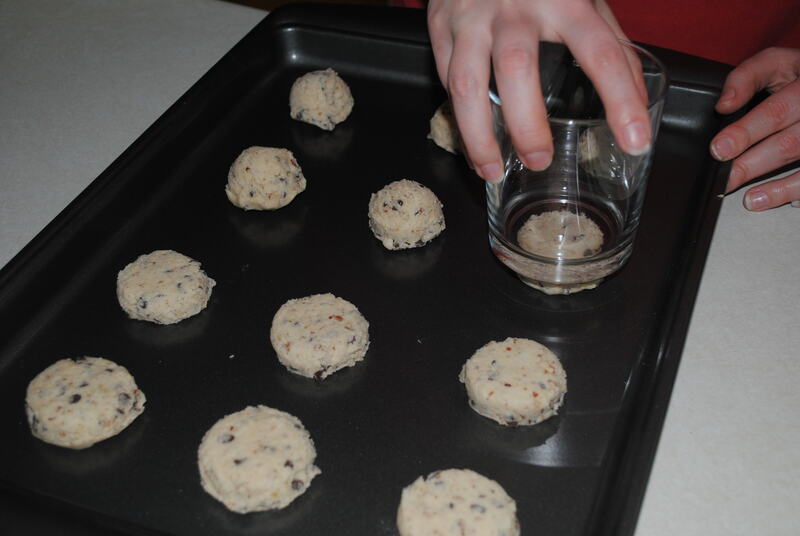 If the cookies begin to stick to the glass you can coat the bottom of the glass with butter, or just use a paper towel and wipe the glass off every few cookies. None of my cookies stuck because I’m a rock star. Bake for 60 minutes or until just slightly browned on edges. Oh that Victor Newman, why do I love to hate you so much?! If you don’t have any Y&R to catch up on you can also prepare the bonus dipping station! This isn’t part of the original recipe, but I usually like to dip them in chocolate and then into some sort of treat like sprinkles, chopped toffee bits or chopped pecans. I use the Baker’s dipping chocolate cup because it contains the perfect amount of chocolate needed to dip the cookies and it’s easy to melt in the microwave. Again, efficiency is my MO. Yay! You decided to dip them!! I melt the chocolate and then dip each cookie half way. 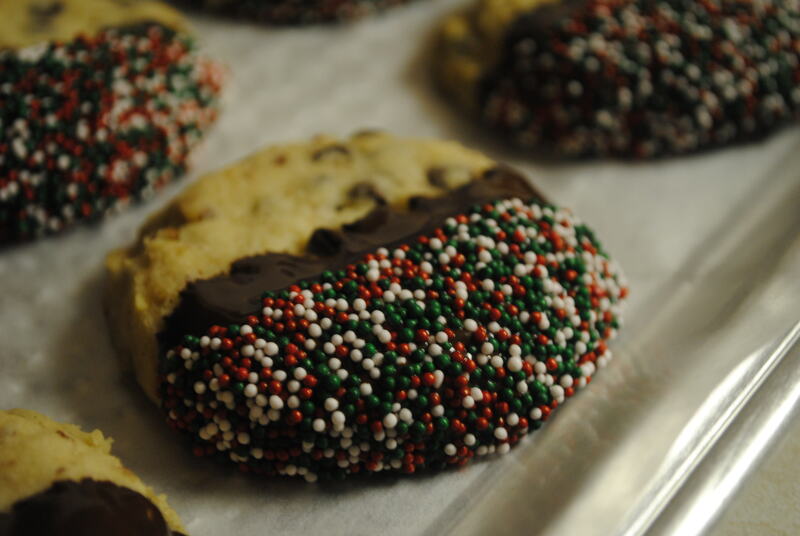 Shake off the excess chocolate and then dip in to the topping of your choice, or just leave as is. Toddler sized food bowls work well for containing the dipping items. If you don’t have children, and are afraid your significant other might think you’re taking the relationship too fast if you came home with toddler bowls, then a regular bowl or wide rimmed glass will suffice. 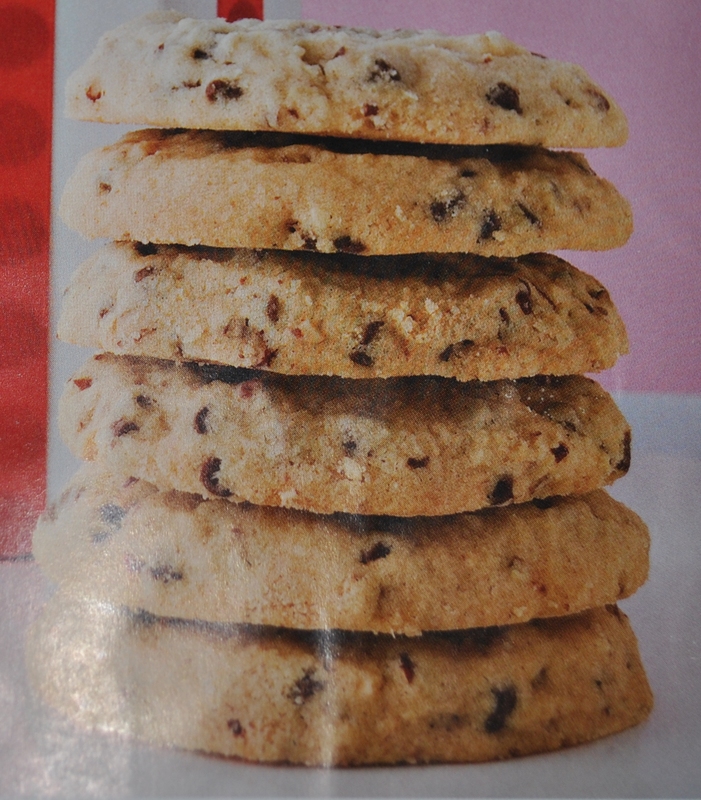 You could even use the same glass you used to flatten the cookies…did I just blow your mind?! My first side-by-side comparison. I think it’s pretty close! 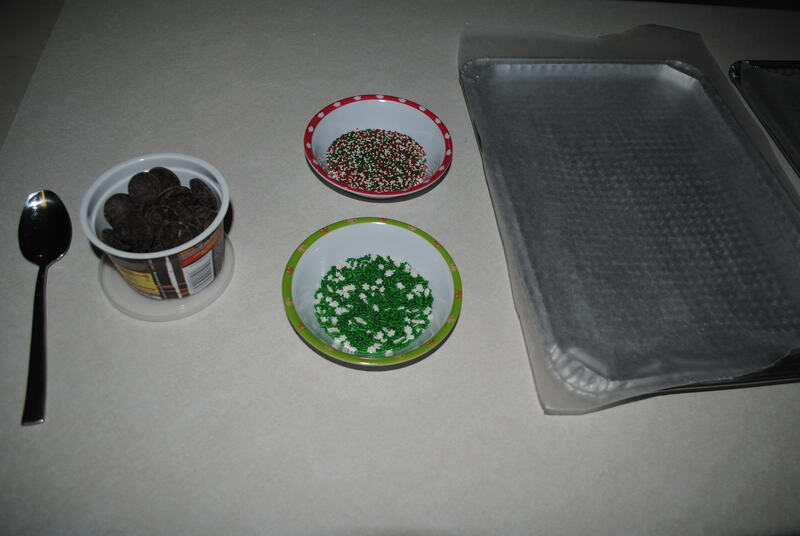 Sprinkles, chopped pecans, toffee bits, etc. Preheat oven to 275F. 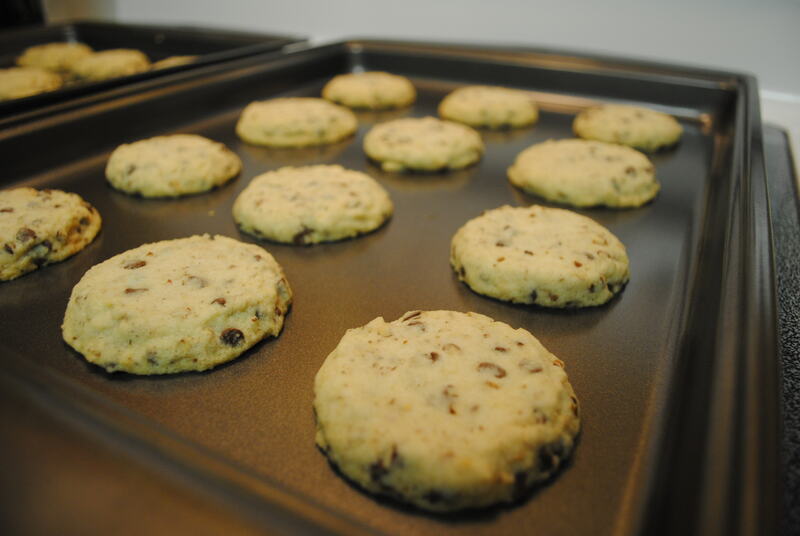 Line cookie sheets with parchment paper (I use non-stick cookie sheets). In medium bowl, combine flour, baking powder and salt. 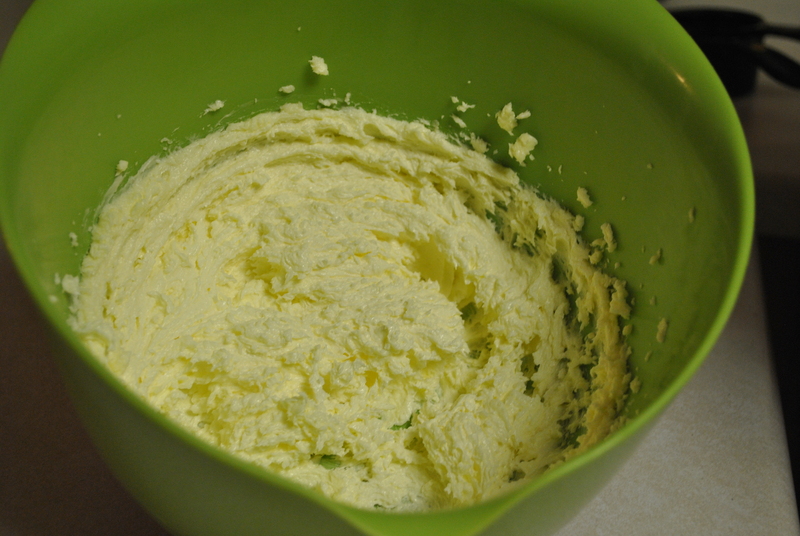 In large bowl, beat butter and sugar with electric mixer until light and fluffy. 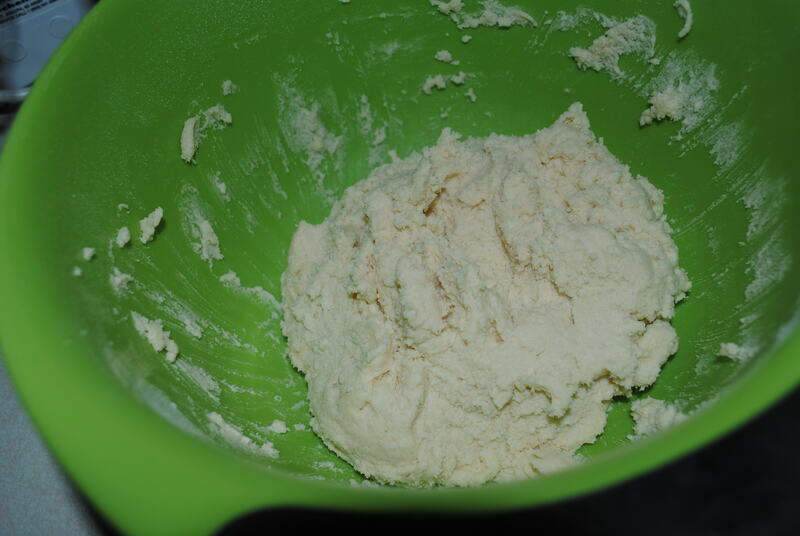 Add flour mixture to butter mixture; mix until fluffy. Stir in chocolate chips and nuts. 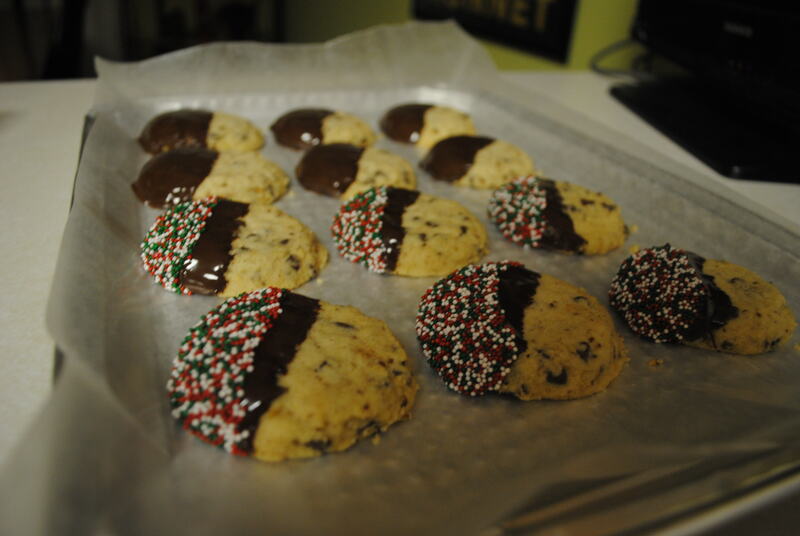 Measure generous rounded tablespoons of dough; place on prepared cookie sheets, about 2 in. apart. Press to flatten slightly. Bake 60 minutes or until just slightly browned on edges. Remove from oven; cool 3 minutes. Remove to cooling grid; cool completely. Some pretty good camera work going on here! Not to mention those great cookies! Yes, excellent camera work! Thanks jimmy boy! These look wonderful and I have an abundance of pecans in the freezer right now, will have to give these a try! Oh, these do look Delicious! Wish I had some pecans. May I borrow a cup Joan? ❤ and Hugs! Thanks! I wanted to comment on your filled sugar cookie post but the Captcha box kept telling me I wasn’t entering the word correct. Weird! 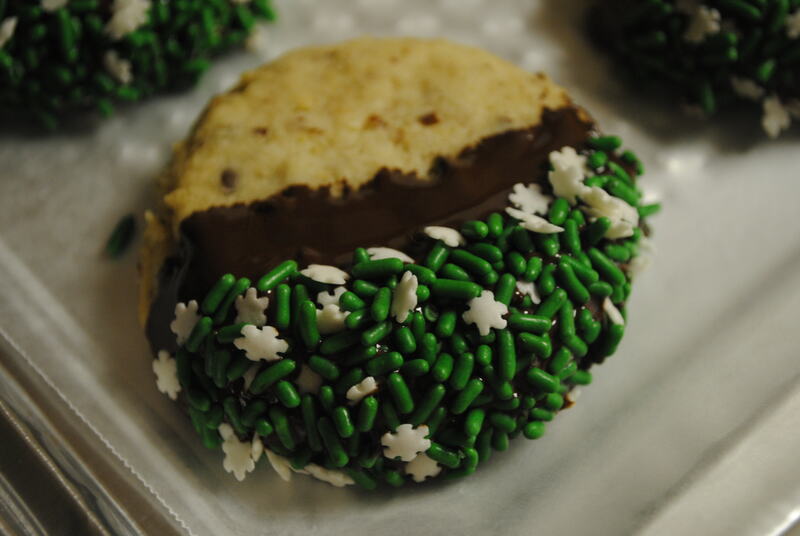 Anyways, the filled sugar cookies sound like an awesome idea! Amy, thanks so much for sending these to me – like you, i don’t normally like “hard” cookies and these are so deceptively tender and buttery. I love them! You’re welcome! Glad you like them. Thanks for all of your helpful blogging advice! !